King of Naples and Spain. Born in Ajaccio (Corsica), 7 January 1768 and died in Florence on July 28, 1844. 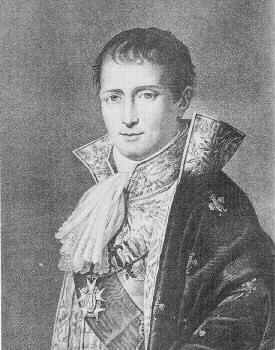 Son of Carlo Bonaparte and Letizia Ramolino, Napoleon'selder brother, graduated in law in Pisa. The rupture with Paoli in 1793 forced the family to go to France. In Marseille, José married Marie-Julie Clary, daughter of a rich merchant, with whom he/she had two daughters, Zénaïde and Charlotte. Thanks to the influence of his brother, was appointed Commissioner of war in the army of Italy, and 23 germinal of the year V, the Corsican elected member of the Council of five hundred. Went to Parma and Rome in 1797, where he/she was Ambassador, and bought in 1798 the castle of Mortefontaine with their land, a magnificent possession 40 km north of Paris. He/She published Moina ou villageoise du Mont-Denis, in 1799. He/She entered the legislative body and the State Council, and was the Chief negotiator of the Treaty of Mortefontaine, on 30 September 1800, with the United States; the peace of Lunéville, on February 9, 1801, with Austria; the Concordat with the Church, between 14 and 16 July 1801; and the peace of Amiens, on 27 March 1802, with England. 28 floréal year XII (18 May 1804) objected to the proclamation of the Empire, it was named great elector, then Senator and Grand Officer of the Legion of honor. Napoleon offered him the Crown of Italy, which did not accept. Regent in 1805, general of division, and, finally, was, first, on March 31, 1806, King of Naples. As such, he/she promulgated a Constitution, abolished feudalism, reformed the Administration, founded schools and began the modernization of the economy, even if it hurt him the absence of a local bourgeoisie that could be the Foundation of the throne, as well as the impression that the new regime was engaged in the systematic looting of the Kingdom. This year listed as Grand Master of the Grand French East. April 18, 1808 Napoleon offered him the Crown of Spain, Carlos IV and Fernando VII had made available to Napoleon in the abdications of Bayonne, in 1808, and José accepted immediately, and, accordingly, was ordered to appear in Bayonne. Thus, it was King of Spain from June 7, 1808, although he/she did not abandon his title in Naples through July 5; José I was sworn before the courts which, gathered in Bayonne, approved the Constitution which Napoleon offered to Spain. A few days of his arrival in Madrid, he/she was forced to leave the capital and fixed his headquarters in Miranda de Ebro. The arrival of Napoleon in Spain and its victorious campaign in November and December, allowed him to return to Madrid. He/She then tried a policy of attraction: tried to reach an agreement with the Central Board, the supreme organ of Government of resistance. People ridiculed him with the nickname of Pepe Botella, in a clear criticism of his fondness for drink. His new Kingdom, in sum, revolted, and José underwent some dislike this, what he/she did miss his Neapolitan period. The illustrated character who wanted to give his Government have been advocated, but circumstances made it impossible to put into practice. Juan Mercader has emphasized his attempts to ingratiate himself to the Spanish, and his confrontation with his brother, since José, aided by his wife, trying to be effective King of Spain. Also noted the progressive aspects of his reign, in the economy (confiscation, etc. ), in urban planning, administration, etc. ; but nothing helped: a vast literature filled him, from the beginning, of insults, and the fate of the weapons was not favorable. He is credited with a Sermon preached in Logroño (Cádiz, 1808;) Mexico 1809), at the expense of López cancelled (even in Zaragoza in 1959). The Spanish press of the time published a letter to Napoleon, dated in Vitoria September 24, 1808 (was posted in the mercantile Journal of Cadiz, no. 300 and 301, 3, and 4 of November 1808). The Gazette of Madrid on January 24, 1809, and the journal of Barcelona on May 1, 1809, published its Circular to the archbishops and bishops of the Reyno, which claims to be deeply religious. In addition, promised evacuation of Spain by the French armies as the tranquility reign. Their proclamations to the Spaniards of my possessions in America and the clergy in general of all his possessions in America (Madrid, 2 and 3 October 1809), found in the file General Militar de Segovia. His letter to Napoleon (published in Madrid, March 24, 1811, in Curt), expressed his despair: "my presence here is completely useless day". A copy of the instructions given to your manager, or leading actor in Baltimore, Mr. Desmolard, and others sent to Spanish America, were published in the editor-General of Spain (No. 129, October 21, 1811); In addition, also some letters of yours, which you were entrusted to M. Deslandes, died on April 9, 1812, were also published: they are letters to Napoleon, his wife, his brothers Luis and Carolina, and Cardinal Joseph Fesch (appeared in the Gazette of the Regency; and the editor, no. 355, on July 3, 1812). A letter from the Queen Julia to he/she directed (Morfontaine, 27 September 1811), in which becomes of lack of money and troops in which he/she was her husband, was published in November 30, 1811. In January 1810, he/she directed the Andalusia campaign. The Cortes of Cadiz gather, he/she tried unsuccessfully to reach an agreement with them. Apparently, the city of Madrid, on May 7, 1812, asked him to convene courts; the response of José, authentic or not, indicates perhaps mood: "I am indifferent to reign or not [...]" "the fundamental thing is to take the English [...] the Bourbons are a few tyrants" (Gaceta de Extremadura, no. 98; La Mancha Gazette, no. 7; both cited by the editor, no. 370, June 18, 1812). The French defeats in Salamanca (22 July 1812) and Vitoria (21 June 1813), where he/she was defeated by Wellington, forced him to leave Spain, followed by the francized; in this last battle was, in fact, where he/she lost the Crown and all papers. Still at this time was still thinking in literature: in a letter dated November 29, 1813, Benjamin Constant was found that José had written a novel with the title of Famille Arabe. On 28 January 1814 Napoleon appointed him lieutenant general, with a mission to defend Paris. He/She left the city, however, on 30 March, and went to Switzerland, where he/she bought a property in Prangins. During the rule of the hundred days, he/she was appointed couple and President of the Council of Ministers in the absence of Napoleon. After the defeat of his brother in Waterloo, in 1815, he/she fled to the United States, and settled near Philadelphia, with the name of the count de Survilliers. He/She was elected member of the American Philosophical Society. In 1819 he/she lived in Bordertown (New Jersey), where he/she had the misfortune that will burn the House. The character and the incident was remembered in 1821 by Frances Wright. The count of Survilliers figure as head of the Masonic Lodge of the francized, according to a pamphlet of 1823. In 1832 he/she returned to Europe, with the purpose of promoting the cause of Napoleón II, but died the Prince before his arrival, he/she settled first in England, and later returned to America. Back to London, in 1841 he/she went to Italy, and settled in Florence, city where he/she lived until his death, on July 28, 1844. TULARD, Jean (ed.). Dictionnaire Napoléon. (Paris, 1987). PALAU Y DULCET, Antonio. Handbook of Hispanic bookseller. 2nd ed. (Barcelona, 1948-1977). Archivo General military of Segovia (leg. M. 2541). Merchant RIBA, Joan. José Bonaparte. (Madrid, 1983). Diari de Barcelona [confront cited numbers]. Commercial newspaper of Cádiz [confront cited numbers]. The General Editor of Spain [confront cited numbers].